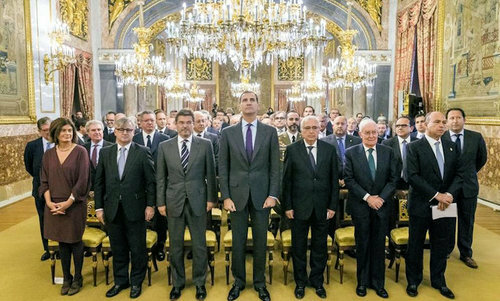 Spain's King Felipe VI on Monday thanked Jews of Spanish origin whose ancestors were expelled from the country in the wake of the March 1492 edict issued by King Ferdinand and Queen Isabella. "Dear Sephardim, thank you for your loyalty," the king told representatives of Sephardic Jews from different countries, during a ceremony at the Royal Palace in Madrid. A law, which came into force last month, allows dual citizenship for descendants of Sephardim Jews. Spain’s Justice Minister Rafael Catala said his administration had already received close to 600 demands for Spanish nationality. The law aims to correct what the Spanish government has called the "historic mistake". In the 1492 Alhambra Decree, Isabella I of Castile and Ferdinand II of Aragon, joint monarchs of Spain, ordered all 200,000 Jews on Spanish territory to either convert to Catholicism or to leave the country within the space of just three months, under pain of death. Christopher Columbus noted in his diary: "In the same month in which their Majesties issued the edict that all Jews should be driven out of the kingdom and its territories, in the same month they gave me the order to undertake with sufficient men my expedition of discovery to the Indies." The Jews' expulsion from Spain followed a demand by the Catholic Inquisition. The expulsion edict was formally revoked in 1968, following the Second Vatican Council, which revised the Catholic Church's relationship with the Jews. The Spanish Jews who ended up in Turkey, North Africa, Italy, and elsewhere throughout Europe and the Arab world, were known as Sephardim, Sefarad being the Hebrew name for Spain. "Thank you for having kept like a precious treasure your language and your customs that are ours too. Thank you too for making love prevail over rancour and for teaching your children to love this country,’’ King Felipe told the guests at the ceremony in Madrid. Today, there are an estimated 3.5 million Jews with Spanish ancestry around the world. The Spanish Jewish community todays number around 20,000.